Wake up your skin with a burst of anti-fatigue hydration. This liquid moisturizer fuels your skin for a refined texture, renewed bounce, and gorgeous glow. Its unique formula is hydrating like a cream, concentrated like serums, and light like essences. It’s formulated with goji berry, lemon balm, and vitamin E to provide antioxidant protection against free radicals. Inspired by Korean skin care routines, this water-infused fresh moisturizer works to address the first visible signs of aging for radiant, refreshed, and healthy-looking skin. The new liquid texture melts right in, leaving your skin feeling smoother and softer – a great base for make-up. Available in volumes of 30ml and 50ml. Water, Glycerin, Bifida Ferment Lysate, Alcohol Denat., Propylene Glycol, Dimethicone, Peg-6 Caprylic/Capric Glycerides, Ci 19140 / Yellow 5, T-Butyl Alcohol, Tocopherol, Lycium Barbarum Fruit Extract, Lactic Acid, Sodium Benzoate, Sodium Hyaluronate, Phenoxyethanol, Caffeine, Ppg-6-Decyltetradeceth-30, Melissa Officinalis Leaf Oil, Ammonium Polyacryloyldimethyl Taurate, Tamarindus Indica Seed Gum, Limonene, Xanthan Gum, Pentylene Glycol, Gentiana Lutea Root Extract, Dioscorea Villosa Root Extract / Wild Yam Root Extract, Caprylyl Glycol, Disodium Edta, Butylene Glycol, Citric Acid, Potassium Sorbate, Citral, Hexyldecanol, Glyceryl Isostearate, Fragrance. I have obtained Lancôme Énergie De Vie Liquid Moisturiser as a free sample of 5 ml, contained in a small tube better fit for the cream or gel but definitely not for such liquid care. Nevertheless, the moisturiser has lived up to all my expectations (i.e. next time I am in duty free - I am buying it!). The proper nourishing care for dry skin such as mine is not so easy to find, thus at first I doubted that this one will make a difference. It did. It has a consistency of 'thick' water rather then that of a gel or such. This fluid manifests very faint and (I would say) neutral smell reminiscent of fresh grass or a cucumber. After application it feels as a revitalising serum is in action. What I mean is it somehow smoothes all uneven parts of my face and the skin feels like velvet to the touch. It absorbs instantaneously leaving no trace. What is even more surprising that the after-effect is visible and felt even after some time (i.e. velvety sensation, 'inner glowing' of the skin). And that is a big incentive to anyone's confidence I admit. It is also a good primer if used early morning at least 20 mins before make-up. Thus till I buy it I am desperately trying to ration my meagre stash of this liquid care. The only thing that have annoyed me so far is the packaging of the sample - I always ended up with having more liquid than I needed due to its design and runny consistency of the item. I guess it is not an issue in case of a full-sized bottle but I still have to give it a try. 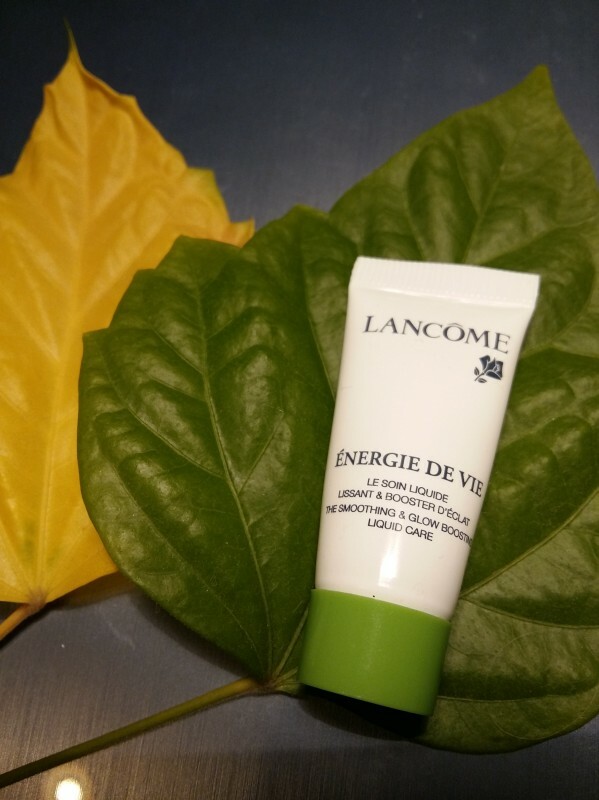 Lancôme Énergie De Vie Liquid Moisturiser is a definite must both for dry, dull and fatigued skin. Just like its promo says - tired of being tired? - and offers this 'life energy' as a solution to the problem.